Radio Shack roster full. Bring on the Tour De France. China's Fuyu Li is on the Radio Shack roster. Team Radio Shack is at full occupancy. They have riders, a ProTour License, the Director Sportif with the most Tour de France winners and a superstar or two. Can Alberto Contador and Astana say the same? Not yet. Assembled from the Astana donor team, Lance Armstrong, director Johan Bruyneel and company now have the roster locked up for 2010. There is no A in this team, no Alberto. The script is tight and no alternations necessary. Radio Shack features 26 riders from 16 different countries. “It is a well balanced team,” said Bruyneel. “We have experienced riders – with some of them I worked already many years in my former teams – but we also have young talents who can develop in the perfect environment.” It’s a good thing Bruyneel speaks about five languages. Radio Shack is definitely going global and in particular has a strong Asian flavor, with Japanese rider Fumiyuki Beppu and Chinese talent Fuyu Li. Perhaps sponsors Trek (bikes), Radio Shack (electronics), and Armstrong’s Livestrong foundation (cancer fund raising) see big opportunities in that part of the world. 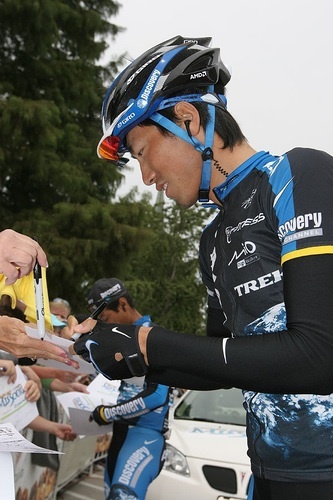 In last year’s Tour de France, Beppu won the Combativity award in stage 21 from Montereau-Fault-Yonne to Paris Champs-Élysées. He also placed 8th in stage 3 and 7th in stage 19. Fuyu Li re-unites with Johan Bruyeel, having ridden for the Discovery Channel squad in 2007. “Our main goal will be the Tour de France and other stage races,” said Bruyneel. ” But I am confident that, with these riders, we can perform very well in the one-day races as well. The first training camp will take place in Tucson, Arizona in the second week of December. Lance Armstrong will make sure China’s Fuyu Li gets a full introduction to Mexican food. « The Tour of Israel. Why, oh Lord?